Here, I read through Dwimmermount (ACKS). I was not a Kickstarter backer - I found Autarch shortly after the KS for that and the Player's Companion ended. I also found the OSR somewhat late in the game, so I had missed the bolus of the Dwimmermount play posts on Grognardia, and therefore this is my first introduction to the setting. I am aboard the ACKS bandwagon, however, and this is the first time we'll see Autarch use it's own domain management rules in a published product. For that matter, this is the first Autarch-published non-instructionary book. From posts I've seen, Autarch has filled out what work James Maliszewski was capable of producing and fixed it up quite a bit. So we should see some of that attention to detail we see in other Autarch products shine through the lens of whatever Dwimmermount was originally intended to be. The PDF is a 420 page file, 54MB in size. It's well bookmarked; each section and even each dungeon room gets it's own bookmark, which is nice. It is likely I'll have minor spoilers in this readthrough. We have here a voice from beyond, as James has his own introduction to what was his megadungeon campaign, in which he explains the conceptual genesis of the place, and an exhortation to take it and make it your own. Autarch then chimes in with a Publisher's Notes, explaining the pieces of the product itself, and then a piece which I think may be a bit of a eulogy for the process of getting this thing to print. They explain where they deviated from what James may have released had he stayed on the project. Autarch fully releases this thing under the OGL, in a move that is both unique, welcome, and, hopefully, a bit cathartic. What is not OGL: The name Dwimmermount; the various company & system names (ACKS, LL), the artwork, logos, and presentation. What is OGL: All maps, text, tables, game statistics. That's everything you need, more or less. The first thing we get is a small map of the area around Muntburg and Dwimmermount, about 15 by 17 hexes in size. It's in the old Judge's Guild B&W 'pattern fill' style, in greyscale. It's of a large enough area to get you from Dwimmermount to Adamas, the largest city defined in the product. For a party that focuses on the mountain itself until it's complete, you may not have to stray from these hexes - Adamas, the largest market in the product, is right on the southern edge of the map. Split into two sections this chapter gives you an overview of the history of the place. The first section is a 'sage's view' of Dwimmermount in the current era - what you could expect to find out from whomever is in the know around the area, as well as a brief paragraph on recent events, where one may start their campaign at. The second section is laid out in detail - the Secret History of Dwimmermount - with things the PCs may only discover interacting with Dwimmermount and it's denizens. It is split into eras, each corresponding to the major actors of the time, each ending with that actor's fall. It's a mix of science-gone-wrong, inexplicable beings treated as gods, religious warring, falling empires. It is well-organized, and it's actually pretty straightforward. There's a clear 'theme' for each era, there's a logical series of events within each era, and it's not something that's chock-full of various NPC personalities you would have to keep straight, nor oft-hyphenated or quote'laden names. Each entry is numbered for reference later in the book. If you're of the type to want to lift Dwimmermount out of the implied setting and drop it in your own, the themes and hooks of this history aren't anything you'll have a problem with; the serial numbers are only lightly attached. Reading through the chapter, I already had a clear grasp of how I'd fiddle with it for my own Baleful Sky proto-campaign-setting. It's a relatively un-gonzo send up of 60s-80s scifi/fantasy mix. This isn't Anomalous Subsurface Environment's 'Saturday Morning Cartoon' style of anything-goes, by any means; the basic fantasy tropes get a bit of sci-fi varnish on them that's easy to wash off for those who don't like mixing their chocolate and peanut butter - there's a little Swords & Planets, a little Deus Est Machina. It's not full-on Thundarr the Barbarian - it's well grounded in it's D&D roots - especially as you consider Burrough's Mars and Jack Vance's Planet of Adventure to be part of those roots. There's a few things laid out in here about how to present a Dwimmermount campaign, in regards to races, classes, and ancillary cultural information. Gods of the various alignments are explored - each god being well tied into the background of Dwimmermount's setting. Each god's clerics are given some strictures, some of which (refreshingly) have in-game consequences - a couple require a cleric to have taken specific proficiencies, which is a nice twist. There's a common knowledge section on Dwimmermount; plus each race is given their specific beliefs about the site, which if kept secret from players not of those races would make for an interesting party dynamic. A random rumor table follows; then a neat bit - sale of party-created maps to local historians, with a value given per room and door by level, with the admonition that these maps could 'go viral' and introduce competing NPC parties at a higher rate. (or allowing players to buy other folks' maps). Then, a table detailing the value of historical facts - recall in the Secret History of Dwimmermount, each bit of history was numbered - this table tells you that, say, Fact 1-3 and 1-4 (Facts 3 and 4 from Era 1) are worth 5,000GP to a sage. That's a great way to encourage exploration in a megadungeon or a sandbox campaign, and one I'll be implementing. A handful of adventure seeds round out the chapter. Each race (Men, Dwarf, Elf) is given several class recommendations, including what not to use to preserve the theme of Dwimmermount (including classes from the Player's Companion). With the exception of the Bard and Dwarven Craftpriest, all of the classes from ACKS Core are recommended for use. The 'priest' is explicitly mentioned as a male version of the Priestess from the Player's Companion, and an alternate Paladin class is presented in the ACKS style. It's not significantly different from the PC Paladin, but has a stricter code. It loses the Aura of Protection, and with the additional code restrictions gains Dispel Evil at 10th plus a special mount at 4th; an interesting choice to make in a megadungeon campaign. They are called out as specifically rare and foreign; I wonder if this is very much a legacy from a specific player in James' Dwimmermount campaign. There's a brief bit on expanding ACKS' spellcaster progression past 14th for what I assume will be NPC use later in the document. Something really cool in this section is a table that links ACKS' Knowledge proficiency (at different ranks) to knowledge that the players could be allowed to possess - broken down by paragraph in the Putative History, and by section in the Secret History. That's a real keen bit of worldbuilding I plan to keep in my pocket for use - giving players who choose Knowledge *actual knowledge* - as an immediate reward for picking or improving the skill rather than as an on-demand tap for information. Dwimmermount's area is based upon the old Outdoor Survival map, ever so slightly modified, so there's a lot of varied topography to work with. Rob Conley worked the map; and it matches up with his Blackmarsh product, so there's a easy way to expand if you're ever in the need. Each area of the map is given a name and a short description, and unique locations are pointed out. There are many specific locations mentioned, each pointed out via hex number on the map, 24 in all. Many are settlements, some are adventure sites - it's certainly not enough to fill the map, so you've got plenty of areas to pop in your own ideas or favorite modules; a few modules from other publishers are mentioned. There are two other subterranean locations mentioned, and an interesting table used for randomly generating locations and connections to other areas - the entire effect being that one can presume much of the map contains various dungeons, catacombs, and tunnels that may or may not lead you far afield. They're helpfully segregated by era, which establishes a theme and where this particular location may connect to, as well as probable occupants. It's an neat mechanic for quickly theming a random hole in the ground - it's advised a 1 in 6 chance per hex to find an opening into one of these locations. The surface world of Dwimmermount is decidedly 'common' - aside from a few module recommendations, it is pretty vanilla psuedo-medieval D&D. Having trawled the Internet for early talk on the Labyrinth Lord version, I can tell you that the surface world is presented as the original author intended - Autarch concentrated mostly on the dungeon itself, touching upon and vastly adding to what they were left with from Maliszewski. While that could be easily rectified for those who wish to do so; recall the history presented earlier - this is a world that has forgotten the origination of their gods, and has regressed to an earlier technology level, essentially. Through that lens, perhaps the PCs could be the harbingers of a new Renaissance through the revelations of the secrets of Dwimmermount. Here we first see domains and realms as defined by Autarch. Since I'm covered under the OGL, let me show you one. Yarm dominates a small realm of 13 6-mile hexes with 4,940 families (about 25,000 people). Its Lord Syndic, Guerin Lamy, has a personal domain that includes the city itself (400 urban families) plus hex 1425 and 4 adjacent 6-mile hexes (1,200 peasant families). The city’s garrison consists of 60 heavy cavalry, 120 light infantry, and 120 bowmen, under the command of a mercenary captain (a 7th level fighter) and a lieutenant (a 5th level fighter). The chapter continues with a table detailing the realm of Adamas, with it's vassal realms; it includes the various types of incomes and costs involved with running an ACKS domain. A detailed breakdown of that table will have to await a later date, though at the time of this post there's already activity on the ACKS boards about it. A market demand table for the settlements detailed appear a bit later. After a short note on mercantile trade, we get into what may be a preview of the content we should expect in Lairs & Encounters - a way to dynamically generate domains and lairs in a hex. Hexes are broken into three types; civilized; borderlands; wilderness. In civilized hexes (with a population density of 600 families - here we see the ACKS defaults being bent to a particular campaign world) civilized hexes may have anywhere from 1 to 5 domains, each with a variable number of families (you either get fewer large domains or more small domains, per hex). Borderlands hexes have fewer domains still; and wilderness domains may only get a single domain, if it's adjacent to borderlands or a named settlement. If they are unsettled, we get a Lairs Per Hex table, allowing us to roll a number of monster lairs based on terrain type. The settlement with the most detail is Muntburg. (Muntburg? It's a little bitty place...) There's a nice, clean map of the town (I'm looking at you, WotC - pretty but oh so hard to mark up) There's 28 locations in town listed; some of which are repeats (anonymous housing, wall towers). There's several NPCs detailed. There's a little note on how disturbances of the peace will trigger the town alarm, summoning 1d4+2 guards in 1d3 turns, with the usual "seek to subdue, will use force if needed" - struck me as funny, something cribbed out of any highschool-aged DM noting a check in place for a rowdy group of players. Locations and NPCs are well detailed, there's information on how to interact with many of them economically, and a few come with plot hooks. The chapter ends with a couple of possible plot hooks and a note about the growth of players beyond Muntburg's capabilities to service - a key time in any sandbox play, as the players have grown in power enough to survive wilderness travel to larger markets and areas. Hey, you wanna see a ACKS NPC stat block? OK! There's several details in this section about the physical location and particular hurdles of Dwimmermount. The dungeon is/can be/has been sealed with force barriers, which can be deactivated entirely, sealed (impervious as a wall of force) or 'activated', which means that certain conditions (creature type, objects held, saves vs., alignment, etc.) allow a creature to pass through. A table is presented. Most of these gateways lead out of Dwimmermount, some are for inner prison areas. The adventure is specifically enabled by those force barriers suddenly coming down. A section on the construction of the dungeon follows; with a small list of special materials (some alchemical, some fantasy-typed metals) given a description and a value. The order of construction of various levels are tabled as well, along with the originally intended purpose of the level and examples of the defining features of the level - each level was built in some specific era by a specific group of people, and as such has differences in materials, architecture, decoration and lighting. There are many types of doors defined in Dwimmermount, from regular doors to sliding pocket doors to dilating doors to what are pictured in my mind like contemporary office glass doors. Lighting is explained; as many places have alchemical 'bulbs'. The various machinery found throughout Dwimmermount is given a location and rules to operate; and then expanded upon more in each level's chapter. Alternate means of travel in Dwimmermount via various pipes and fissures detailed is expounded upon. The chapter closes out with advice on how to keep Dwimmermount looking active while the PCs are away, and touches on customization, including calling out a few places where objects, creatures, or events lack full description in the product, as a hook for the Judge to hang something on. This was an interesting section - as I'll mention in other places, a lot of this can be read as guidelines for what to think about when designing your own strongly themed dungeons - having these sorts of details thought of and listed in a single place can help get a unified feel to the whole thing. Now here's something: Factions. These are the existing power groups within Dwimmermount; each with their own agenda, each having a relationship to the others. The book starts off by detailing origin types - in Dwimmermount from the time it fell, built/grown/awakened since the seal broke, or three classes of visitor, from around the world or beyond the world. 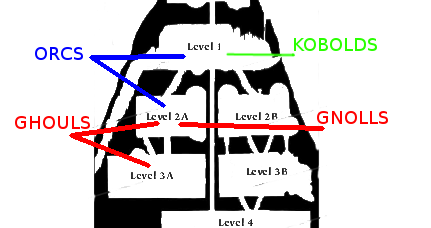 Then follow two tables; the factions by level, with their leader, and the location of the leader in the dungeon, and a second table detailing each faction's allies, enemies, and again the level they operate on. After that, a description of each faction by level; so factions on multiple levels get multiple entries. Lastly, a bit of advice about faction activities. The onus on the Judge is to have all these factions active and in motion, if they wish to - either the faction is in the state that the book states it is at the point in time the party encounters said faction, or, if you've been tracking days, the factions have continued to move their plans. As an example, the Orc faction is currently aligned with the Kobolds (the Kobolds are aligned with the Spiders, but the Spiders aren't directly aligned with the Orcs); they (Orcs) are enemies with the Ghouls and Gnolls. You'll also want to note the Ghouls and Gnolls don't get along. Turns out ghouls eat anything. That's starting Level 1, and from the location description you'll want to have notes on how those relationships are actively playing out before the party enters that level. What if the party fears the ghouls, and convinces the Orcs and Gnolls to band together, for example? Can the party get the Orcs and Gnolls to wipe out the Ghouls then arrange for those two factions to fall upon each other? What's that do to the Eld who also inhabit Level 3A? And this isn't any different then the machinations that you as Judge do for your petty lords and merchants on the surface - but it's all much more immediate and personal, there under the tons of rock called Dwimmermount. There's a lot of information in here, and this may be the chapter that takes the longest for most people to really digest and internalize. This chapter - not the one with all the maps - is why it says "Megadungeon" on the cover - a product with that moniker that's not making you sit and think and work these sorts of things out after giving you the snapshot of the environment is doing you a disservice. Given the value of information and maps of Dwimmermount, and the implied 'gold rush' that is just spooling up as rumor of the mountain's opening spreads, other adventuring parties may become the most hated faction of all. Yon meat and potatoes - the dungeon maps and room descriptions. Each chapter in this section starts with the dungeon map, a short overview of the history/function of the level, with a wandering monster table. Each room is named; a welcome sight, as in naming associations are made in the mind of the Judge and every bit helps when one is preparing to host players. It's difficult to review something like this without playing it. As with any published adventure, it behooves the Judge to read through plenty of times to get the place (or likely places the party will be) set into mind, notes taken, pages marked. Monsters are given terse statblocks in the usual OSR style, references to other places or locations are called out by room number and level number when appropriate. The wide sidebars allow for short notes, the vast majority of which are notices on what the players can study or who they can befriend/interrogate to learn the secrets of Dwimmermount detailed in Section 1. Many of the interesting rooms are paired with a bit of artwork, easing explanation. The maps themselves are well presented. I'd had hoped that all the previous love given to door types would have made some impact on the icon design; the preparing Judge may want to think up his own way to clearly delineate them. There's a slight step back on map printability - the background matte is a bit 'staticy'; making it harder to eliminate for printing. Dwimmermount is a dungeon with a purpose, and that will bear out through play, reading through the rooms. Each level is laid out with that in mind, and feels functional, without giving up that je ne sais quoi that makes these levels into dungeons and not somebody's office building/research lab. Each level has a clear theme, and the many factions working in Dwimmermount play off of each other in a logical way - the Judge wanting to make this a live dungeon shouldn't have much issue taking a bit of time to do so after the player's sessions. I could see a slow party, in fact, missing a lot of the as-written content of the place if a Judge really gets into his role. There's plenty of places in the dungeon for the party to find allies, even unlikely ones, if they are careful, or of somewhat questionable morals. This is where magical items found in Dwimmermount that are not in ACKS (and presumably LL) are listed. A good number of these are imports from 1E; Dwimmermount is no exception to the rule where 40+ years of D&D gets a lot of cross-pollination of items, spells, and the like; where your peanut butter and chocolate get so mixed you should have just bought Nutella - strong classics like the Bag of Tricks or Feather tokens; Ioun stones, Pearls of Power, the random assortment of self-improvement books. Some items are from 'off-world'; those are strongly Barsoomian in flavor. Others are items found within Dwimmermount that integrate and operate it's more technological aspects. There's more than a few original-to-me ideas in here as well; some of them I won't cover for fear of spoilers. Again, very much the importation of 1E spells. We get a few more rituals, in Gate, Holy Word, and the venerable Symbol. The majority are arcane. Some classics, some presented as unique in Dwimmermount. We get a range of demons in ACKS stats, from Manes to Balor. There's several new constructs, some of which powered by Dwimmermounts 'azoth' material. There's several new undead sorts; Liches are present, then a handful of humanoid undead types unique to Dwimmermount's particular situation. Several of the monsters are ...Planescape-ish, one from the Astral Sea, another whose dungeon encounter group can be referred to as a 'ganglion', if you know what I mean, and I think you do. Dwimmermount's implied setting would be woefully incomplete without a couple of those classics locked out of the OGL. Woefully underused, sometimes badly used; rival parties can get a group of players going like few things can - there's nothing worse than someone else getting to kill things and take stuff you planned to take after killing the same things. The only thing better are rival parties of other real players. There's several teams; ranging from 1st level noobs to 6/7th level seasoned campaigners. Each team has a general motive, each member given a personality. They all come with a table of sample jobs and pay rate for those jobs, which is a neat way to allow real players (or meddlesome NPCs) to farm out tasks. Each takes a different pay rate for different levels of the dungeon, which would be interesting on several fronts - either as a rearguard or if the player party decides to subcontract the whole NPC party out as a group of henchmen. Dwimmermount's Sword & Planets base is revealed fully here; there is the moon of Telluria plus 3 planets, evidently, in the system, each with their own particular biome and residents. The nature of the Astral Plane is touched on, since there are things in Dwimmermount useful there, as well as a light section on other planes. Azoth is special material found throughout the cosmos of Dwimmermount's setting, but is found in great supply in Dwimmermount itself. It has many uses, depending on what form it's in. Raw, it's mostly a pyrotechnic. Refined, it interfaces with ACKS' magical research rules, aids in spellcasting, can do a miraculous healing, formed into sovereign glue or it's solvent, or a super-acid. It's also used in several new additions to ACKS' transformation rules. In short, it's ridiculously useful; and amongst other artifacts in Dwimmermount is one of the main plot drivers of several of the factions active in the dungeon. Naturally, it's also harmful in the long term or in large quantities; including such side effects as mutation, explosion, loss of levels, gain of levels, loss or gain of magical powers, bloating, weight loss, depression, and erectile dysfunction, to name a few. Some of those are not real effects. The main antagonist of Dwimmermount is given life in this appendix. It closes with a method of achieving immortality compatible with ACKS' Magical Research rules; the exact method by which Turms managed to get ahead in life. Lastly, several tables of given names and surnames of the various races and regions are given. Illustration Book: Contains larger versions of the illustrations of specific areas in Dwimmermount. Map Book: Contains larger versions of the dungeon maps, plus a larger wilderness map. If you plan to run Dwimmermount with the included regional areas, I'd strongly suggest this - the regional map in the book isn't conductive to larger-format printing. Dungeon Tracker: Take a look at the preview version on RPGNow - it's very useful looking, and does to the dungeon maps what many of us would do anyway to prep to run something of this size. At $10, it's well under the time-value-of-money calculus of doing it yourself, and having it printed in it's native large format is pretty damn cheap. The Tracker ought to become the de-facto standard for presenting dungeon levels - it's that nice. As one should expect from Autarch; this is a clean, well presented product; and don't think that's a small feat. They've taken Random Internet Blogger's homegrown campaign, and, 420 pages later, have output a product that works, and is consistent with itself. And they did it without Random Internet Blogger's continued help. The setting is unique. Some folk may be turned off at the thought of 'space elves', but, keep in mind the difference between 'plane' and 'planet' is an extraneous 't', and what you're really dealing with here is simply an alternatively presented cosmology. It can be argued Tolkien's elves are aliens. What struck me in the read through is how to use Dwimmermount as an example - a how-to on presenting a themed dungeon or campaign world. I think the expectations set around the product before and after it's issues and during it's extended development ended up catalyzing something greater than I think it could have been under Maliszewski's stewardship. Factions whose motives are derived from the above history, and whose methods lay consistent with that and the structures and features of the dungeon. A megadungeon that is mega, and stays managable, without shying away from large themes, or collapsing under it's own plot. It is a font of ideas - not only setting ideas, but presentation and preparatory ideas, not only for someone who would want to create their own dungeon, but for someone just setting up a sandbox environment, and wanting some structure to hang hexes up on. Cut off Section 2, the dungeon itself, from the book and you still find yourself with a handy reference for a sandbox campaign. Add Section 2 back in; either in whole or parts (spread the levels of Dwimmermount across the whole board, if you'd like) and you've got hours and hours of play. And it's all OGL; fold, spindle, and mutilate it - then share it back out as you like. All of this, then, for $10.00; a madly underpriced PDF for what you're getting out of it, especially as compared to other megadungeon products. Take it as it is and you'll enjoy it just as much as if you dismantle it first; either way you're getting real value. I'll end up using it, in whole or in parts. It meshes well enough with what concepts I've already got going that it's going to be very easy to let Dwimmermount grow as a seed to continue to flesh out my own view on my own 'space elves' and 'Ancient Ones'.